How Many Pixels Are Enough in Your Digital Images? 1Keep your photo files editable. Large image files make big demands on your computer’s memory (RAM) when you edit them. 2Make your Web-bound image files lean and mean. Huge image files on a Web page take forever to download (especially with a slow modem). 3Don’t make your image files larger than necessary. Use the appropriate number of pixels to suit your final output device (screen or printer), but no more so that you don’t waste pixels (and memory). 4Decide whether you need that image in color, after all. 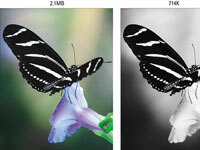 Color image files are larger than grayscale pictures because a color image requires three channels of data (for red, green, and blue), but a grayscale photo requires only one. As an example, both photos in this figure have the same pixel dimensions (750 x 940). 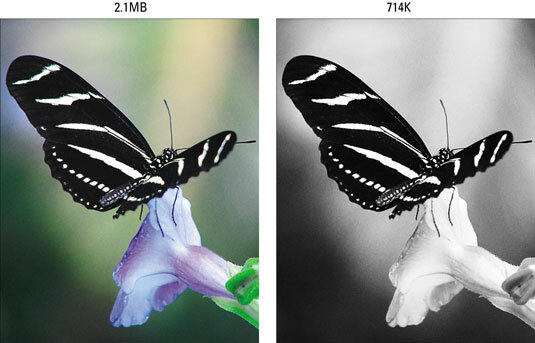 But the grayscale image file size (714K) is about one-third the size of the full-color version (2.1MB).